Oppositions of Mars 2001-2014 Mars comes to opposition about every 25 or 26 months. Due to the ellipticity of the Martian orbit (e ~0.1) the Earth-Mars distance can vary quite a bit at different oppositions. The last close opposition distance was in 2003 (which happened to be the closest opposition in 60,000 years, although others have been almost as close). 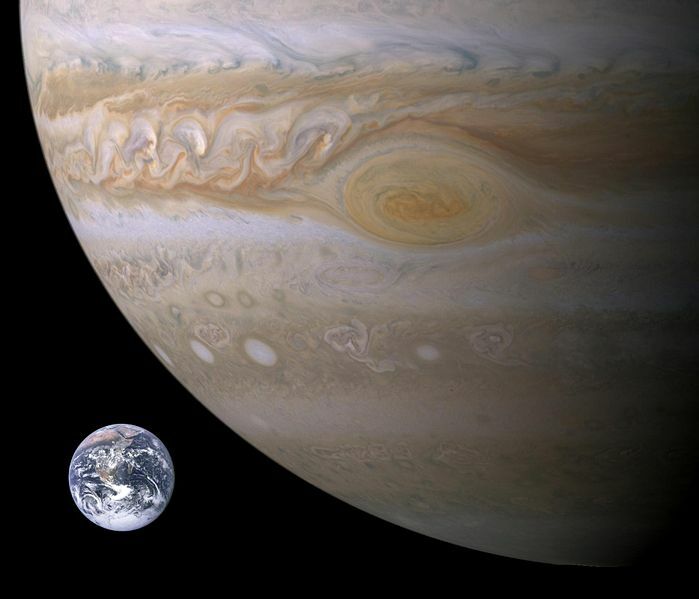 The upcoming opposition in 2012 will be a very poor one, with a minimum Earth-Mars distance of 0.67 AU, almost twice the 2003 distance. Mars in 2011 This graph shows the angular diameter of Mars as seen from Earth during 2011. 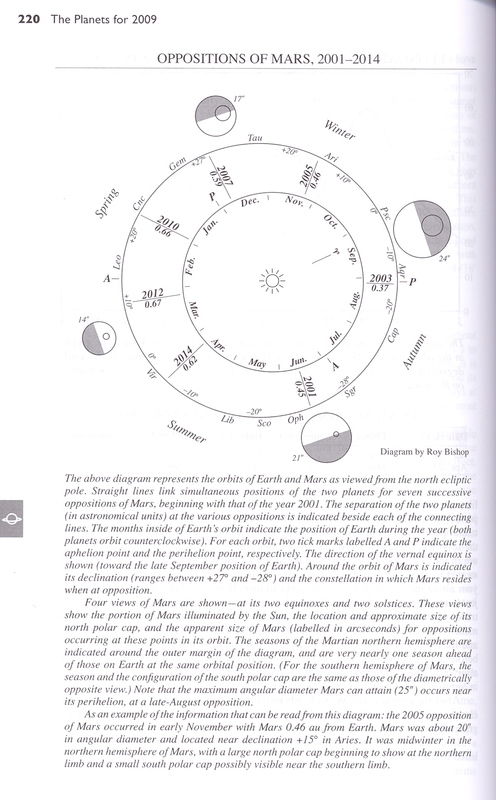 At the best oppositions, like the one in 2003, Mars is about 25 arcsec in diameter. 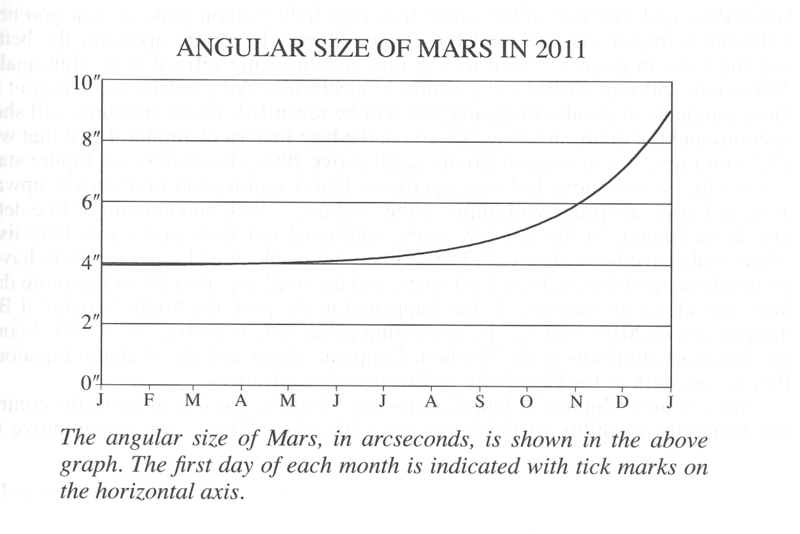 So, sports fans, from the graph you can see that 2011 is a very bad year for looking at Mars. 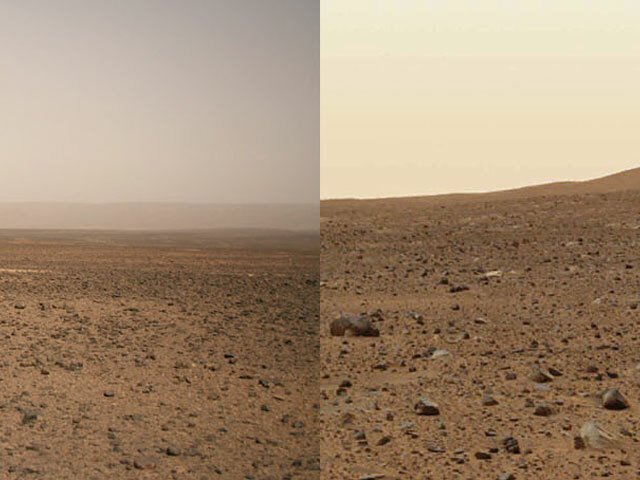 As 2011 ends we are approaching Mars. 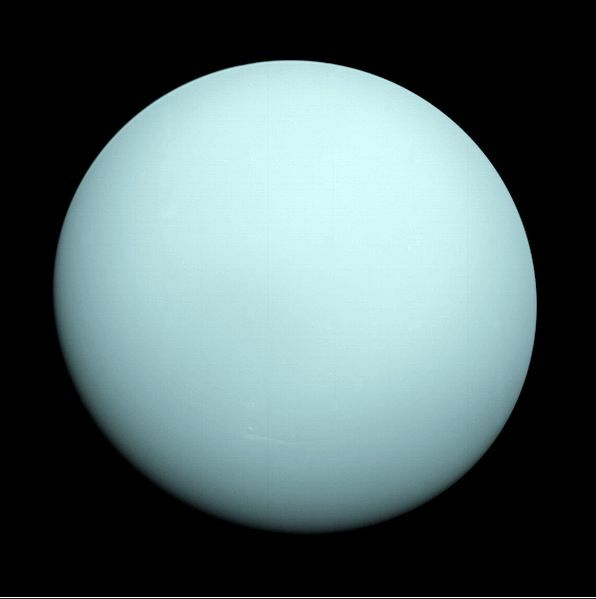 Mars will be at opposition in early March 2012 and will be less than 14 arcsec in diameter. 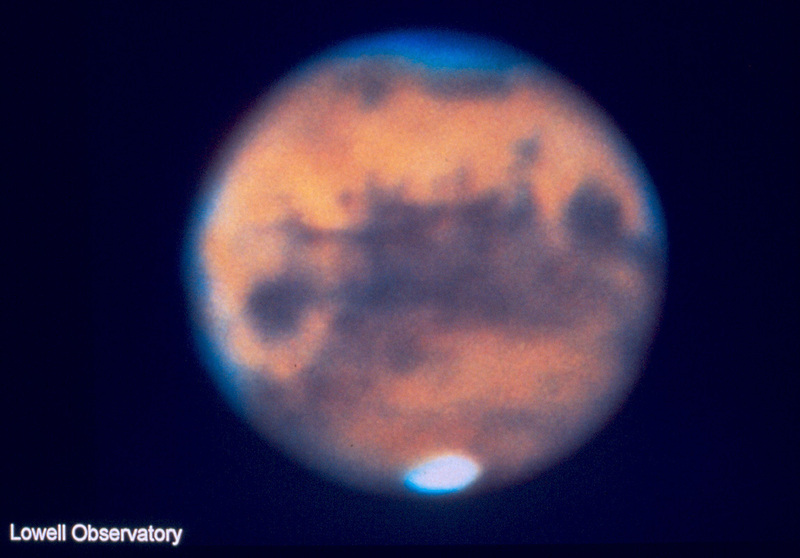 Mars was last at opposition in early 2010. It was about 14 arcsec diameter at closest approach in 2010. Not a very good opposition, but Mars was in the northern part of sky, meaning it passed almost directly overhead (where atmosphere is least bothersome) as seen from N. hemisphere. The 2012 oppostion will be similar to the 2010 oppostion. The next "really good" opposition will be around 2020. 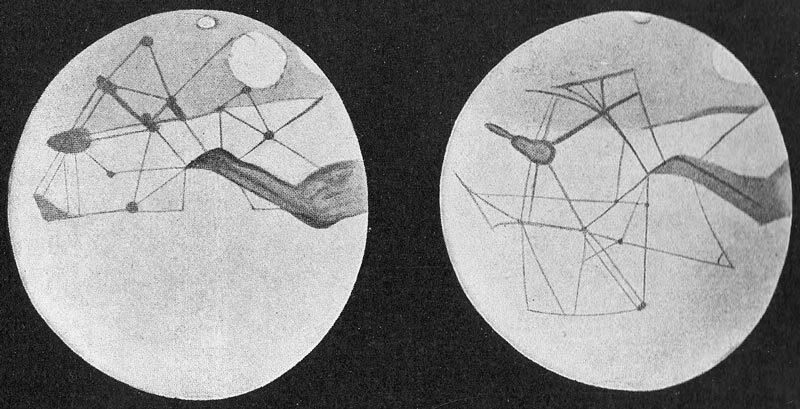 Schiaparelli drawing of Mars The late 19th c. Italian astronomer made drawing like this of Mars. Some of the features are real, most (particularly the linear "canali") are not. 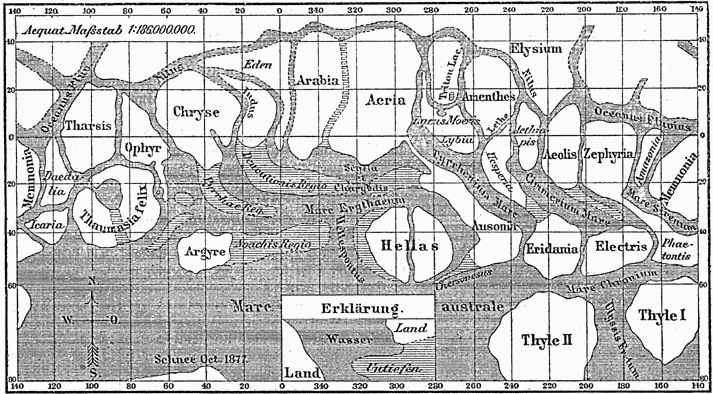 Percival Lowells canals on Mars Around 1900, Percival Lowell ("self funded" astronomer from an old money Boston family) popularized the idea that there was a Martian civilization that built "canals" to bring water from polar caps to crops. What was Lowell seeing? 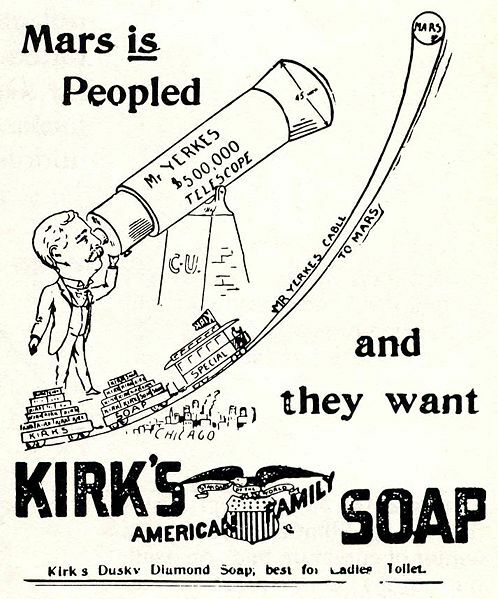 Soap ad around 1900 In the early 20th c. , everyone "knew" there was a Martian civilization, mainly due to writings of Lowell. It was all nonsense, of course. 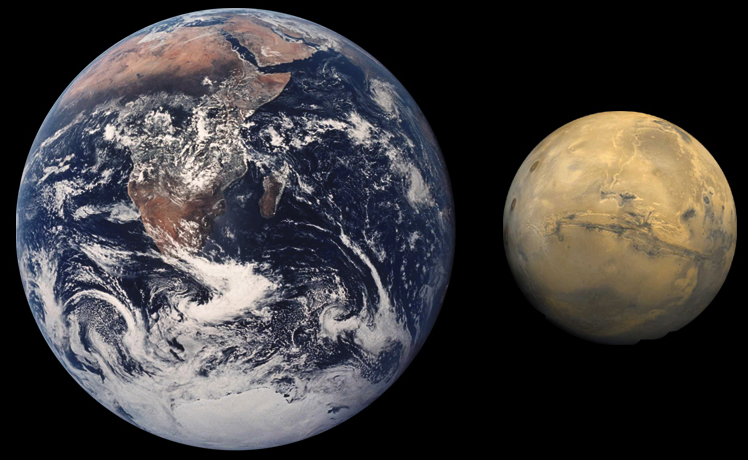 Earth and Mars to scale Mars has a radius about 0.53 that of Earth. 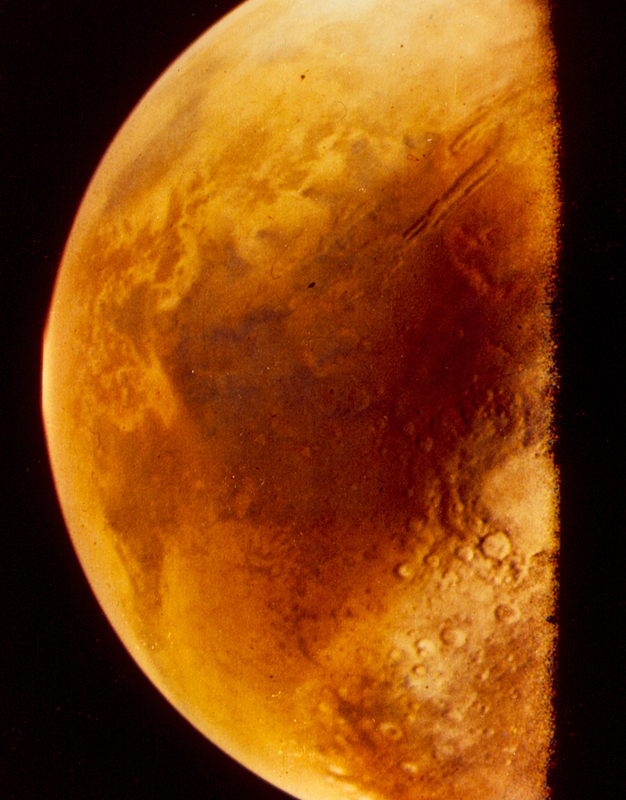 Mars from Earth Taken at the famous Lowell Observatory, in Flagstaff. 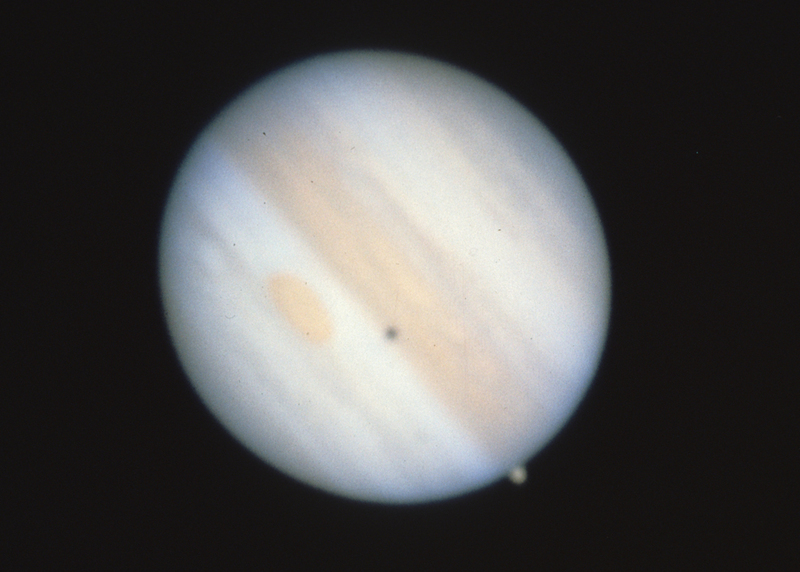 Lowell was founded (and funded) by Percival Lowell. Lowell Observatory is one of the largest observatories not associated with a university or government, and part of its budget still comes from an endowment left by PL. 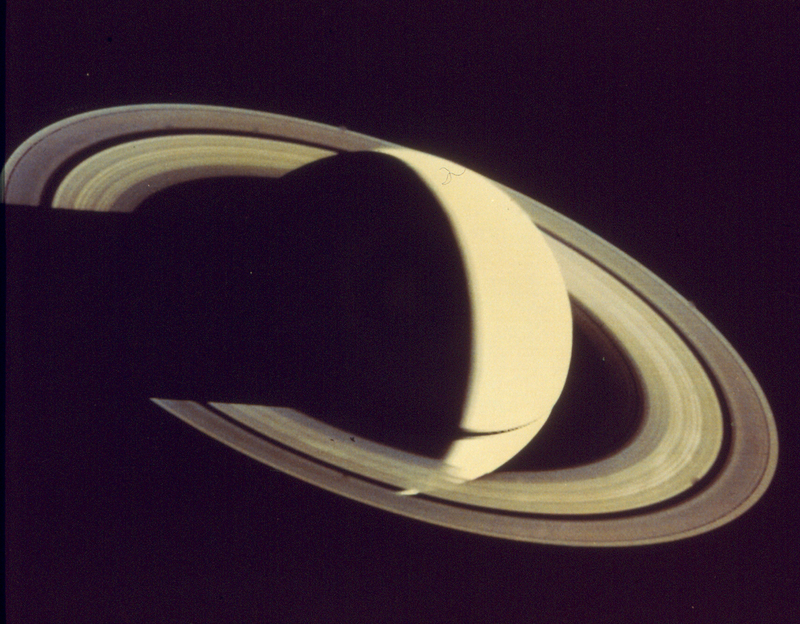 So, even though PL was way wrong about Mars, he left an enduring positive legacy for astronomy. 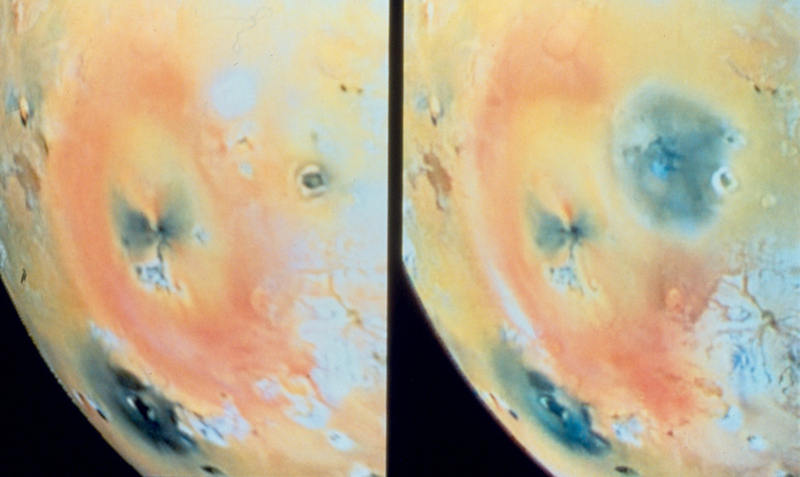 Using Earth-based telescopes, we can see only some vague dark and light patches on Mars, along with polar ice caps. These dark patches sometimes appear to change from week to week. 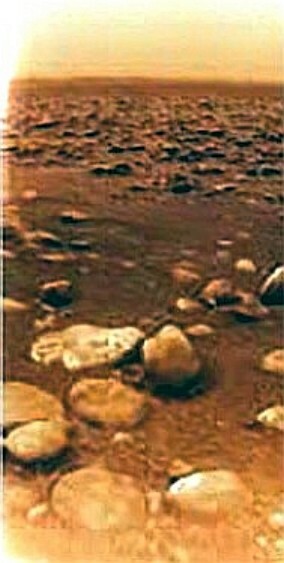 This was another observation that Lowell used as evidence for life on Mars. He said the changing markings were due to crops growing. We now know that the changing patterns are due to wind blown dust covering and uncovering underlying areas on the planet. 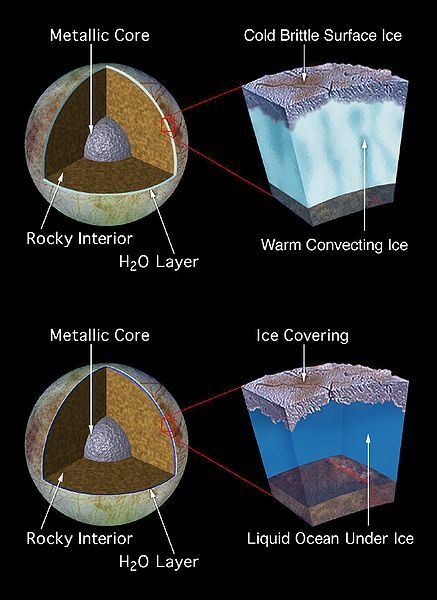 The polar ice caps are composed of water ice and frozen CO2 (dry ice). 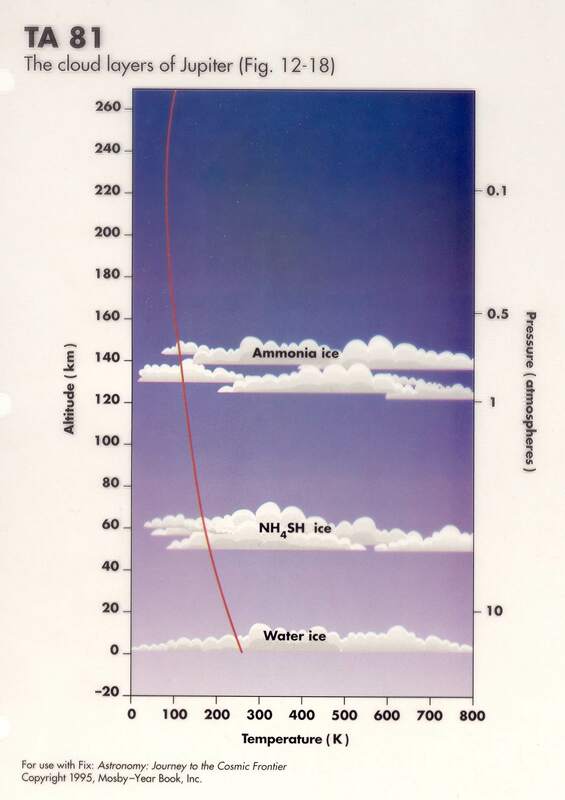 The CO2 cycles between north and south polar caps with the seasons. 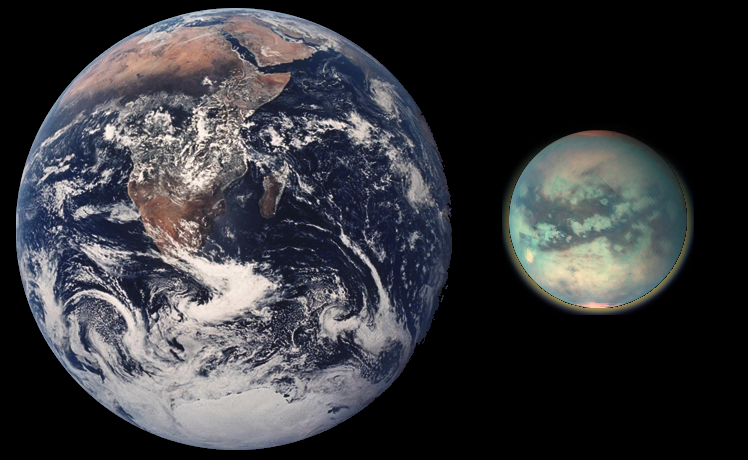 Mars has some striking similarities to Earth. It rotates in 24.6 hours (called a "sol"). The poles are tilted about the same as the Earth's, so there are seasons somewhat like those on Earth, but longer of course as it takes Mars 687 (Earth) days to orbit the Sun. 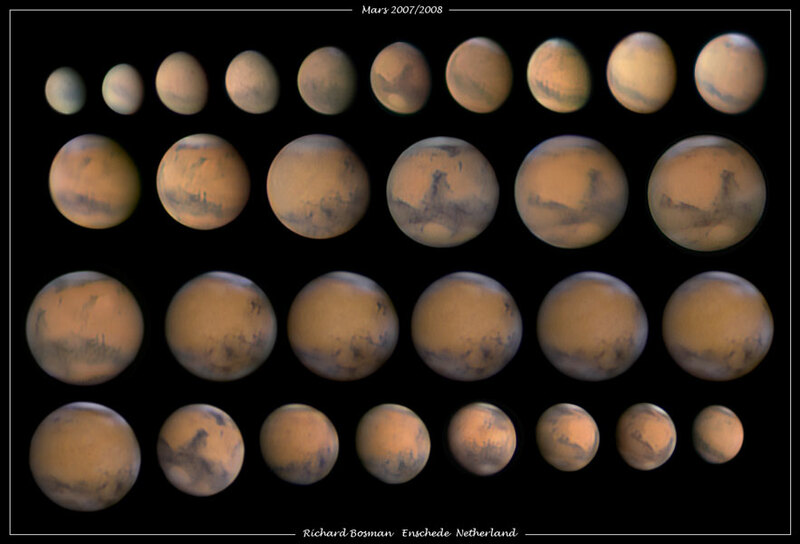 Mars from Earth Mars around opposition in 2008. 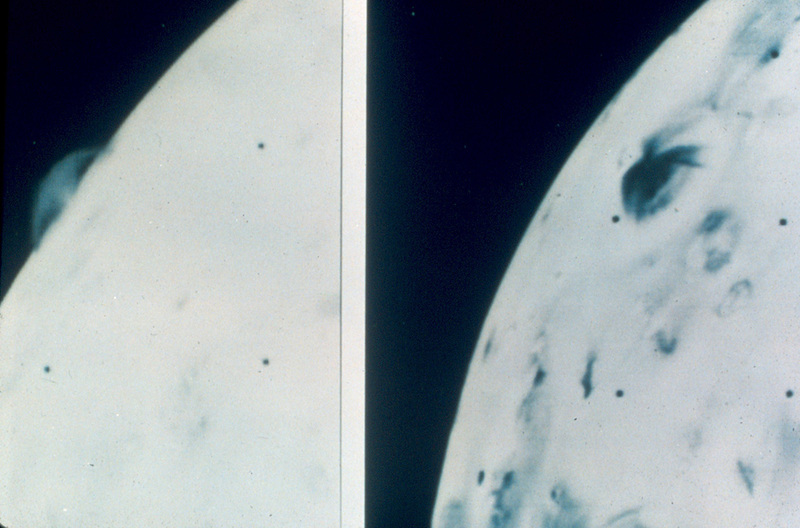 At closest, Mars was about 17 arcsec diameter. 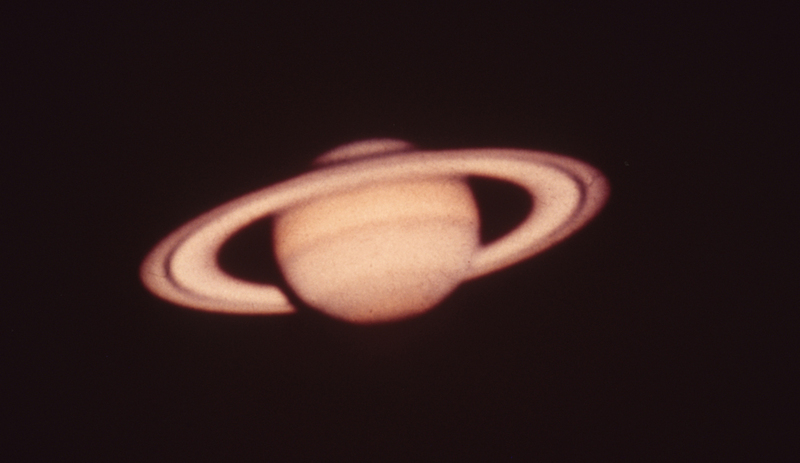 These images were taken with a small telescope. They were probably taken with the "take LOTS of images and throw out all but best" technique (which is really only useful for bright objects that you can image with short exposures!) Note the phase effects which can be best seen in the top row of images. Mars from approaching spacecraft The first spacecraft images were a disappointment to the "canal crowd". They showed a surface with impact craters and old volcanos, but no canals! 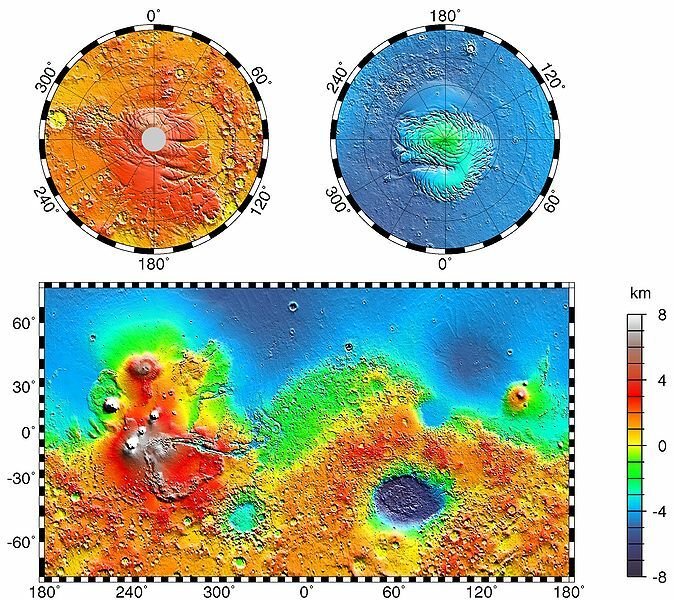 Martian global topography Mars shows a global "hemispheric dichotomy". Spacecraft altimeter and gravity maps show that much of the northern hemisphere is on average 4 km lower than the southern hemisphere. New models hypothesize that this could be due to a giant impact about 4 Gyr ago that blasted a 10,000 x 8000 km basin. (See 26 June 2008 NATURE for details). 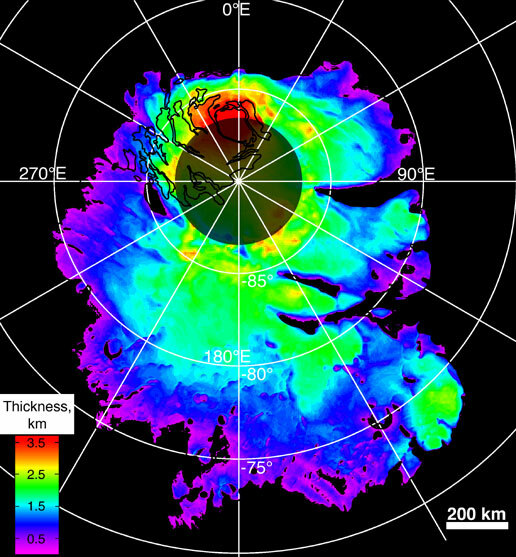 The Hellas Basin is the purple ellipse around -40 lat., 70 long. It is a 2300 km wide impact basin. A smaller impact basin, Argyre, can be seen at lat ~-50, long 320. 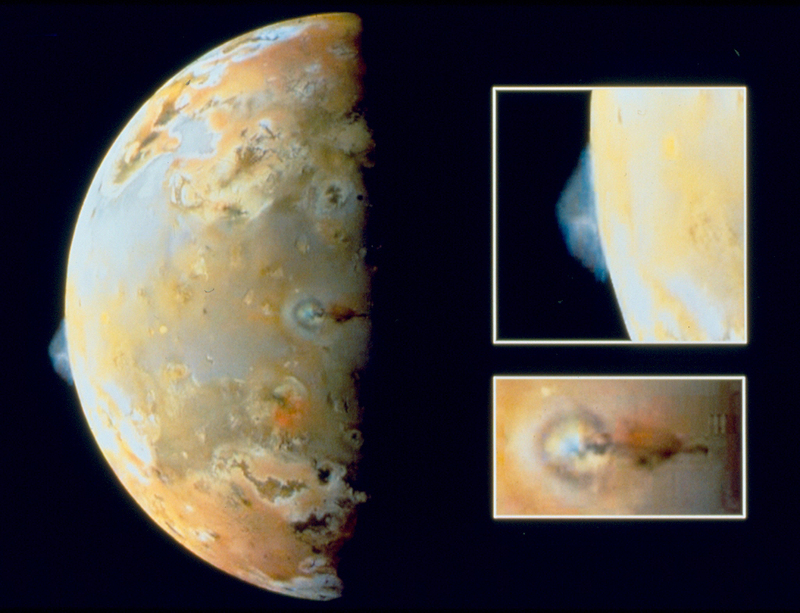 Other large impact craters can be seen across planet. 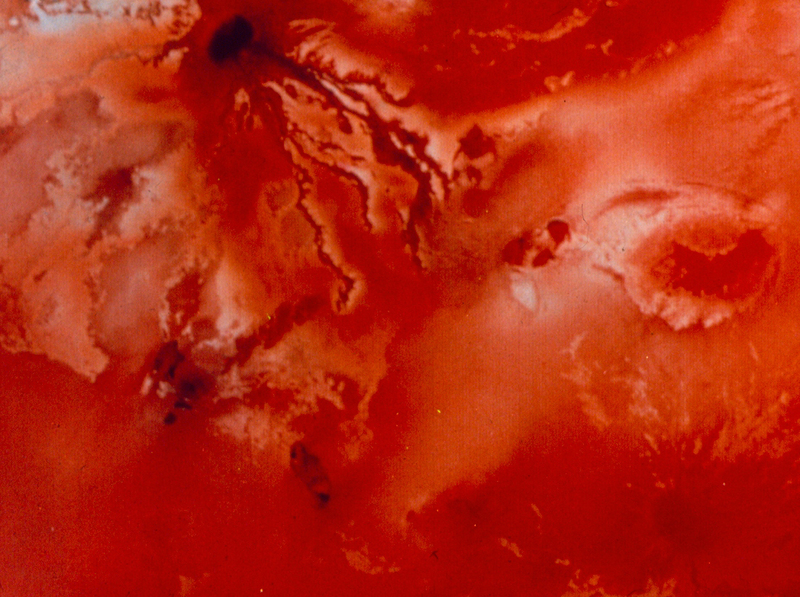 The large reddish blob centered at about 260 long on equator is the Tharsis Bulge, where all the large volcanos are, as well as starting point for Valles Marineris. 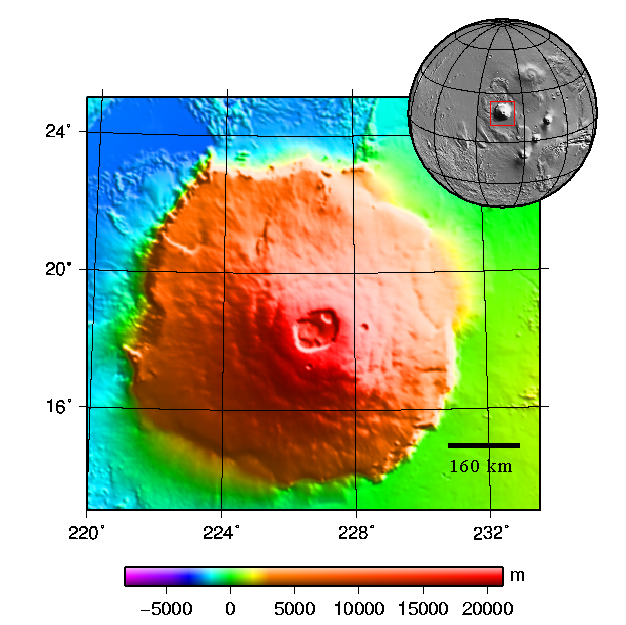 Olympus Mons This is the largest shield volcano known in the solar system. 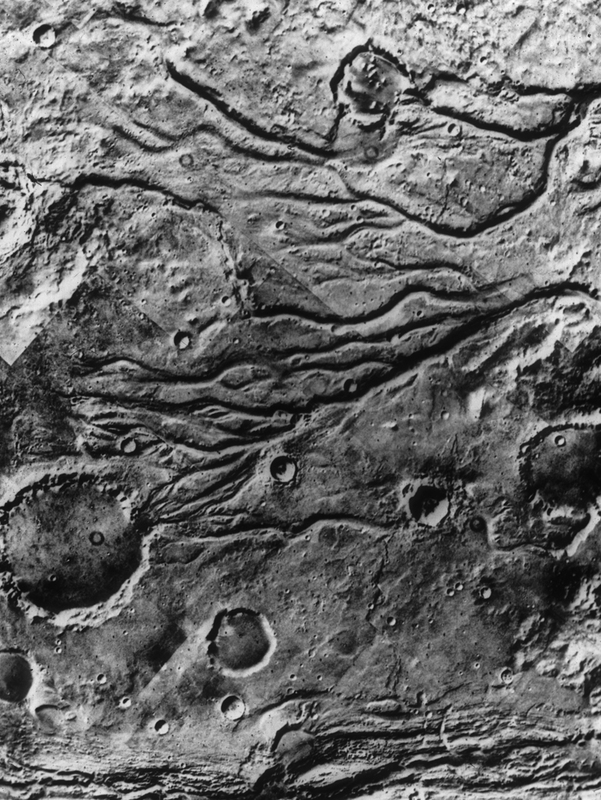 Valles Marineris A huge gash in Mars. This feature does NOT correspond to any of the features on Lowell's maps. 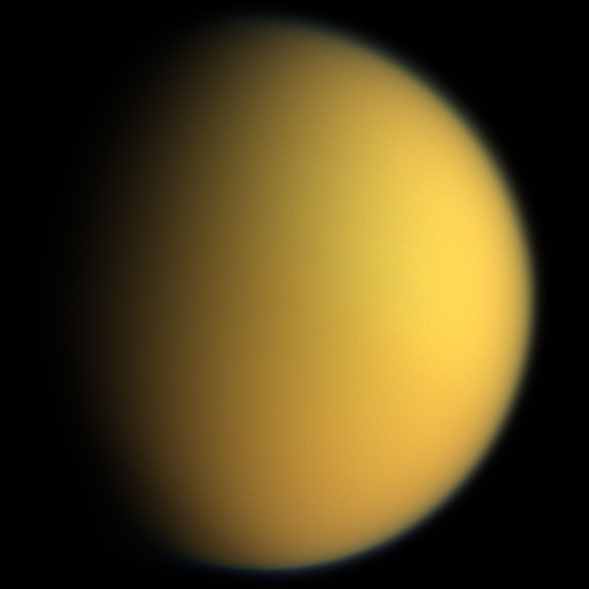 It is of too low a contrast to be seen from Earth with current techniques. 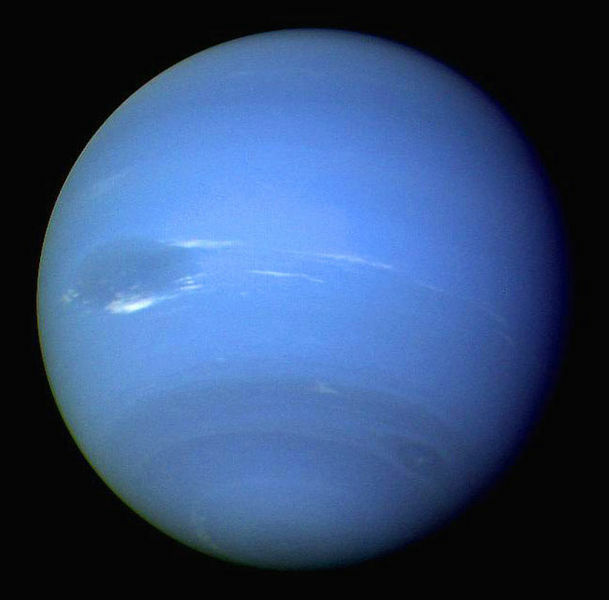 Named after the Mariner spacecraft. 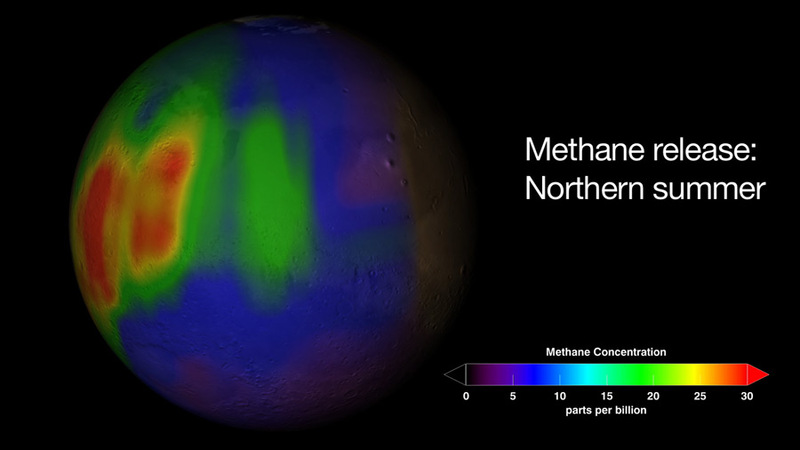 Methane in Martian atmosphere Ground and space based spectroscopic observations detect methane in the Martian atmosphere. Methane is easily destroyed by solar UV photons, so any methane would only last a few hundred years in Martian atmosphere. So what is the source of this methane? Its either biological (bacteria or Martian cows) or non-biological (water- rock interactions?). Stay tuned, sports fans! This could turn out to be HUGE! 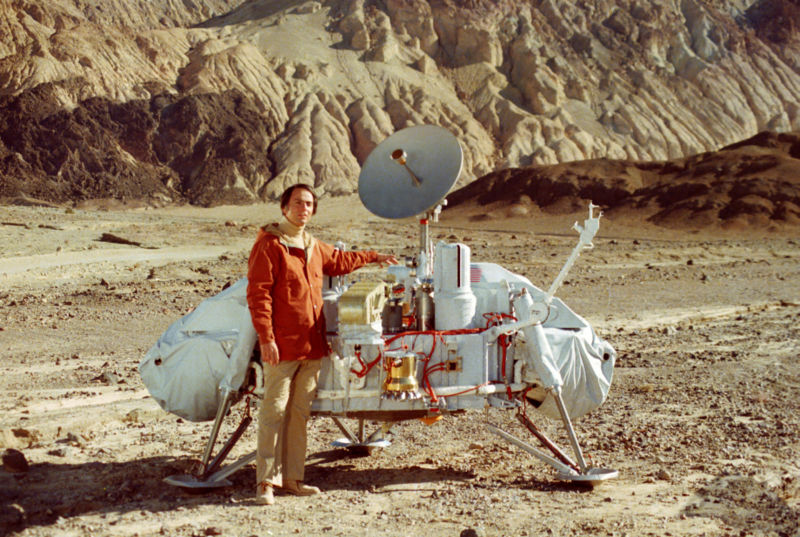 Sagan and Viking Carl Sagan next to Viking mockup in Death Valley. 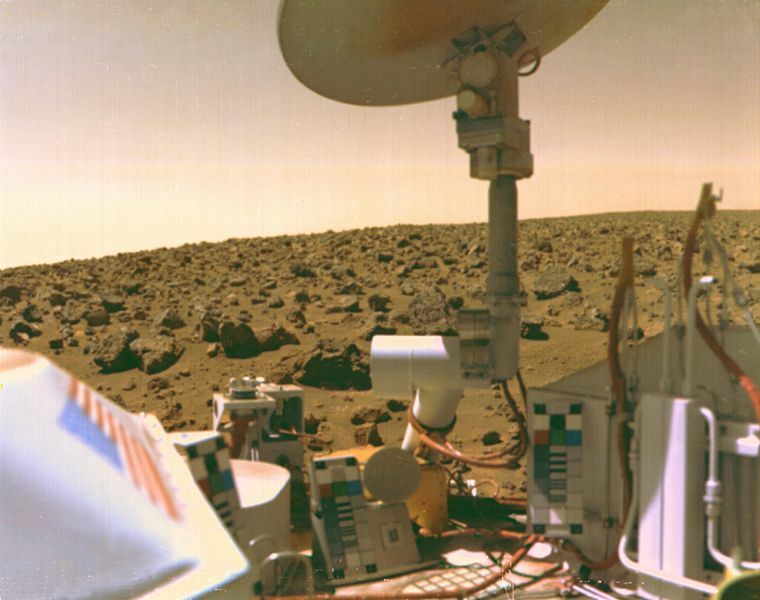 The two mid-1970s Viking landers (and also 2 orbiters) comprised a very ambitious and expensive set of missions to explore Mars and look for signs of life. 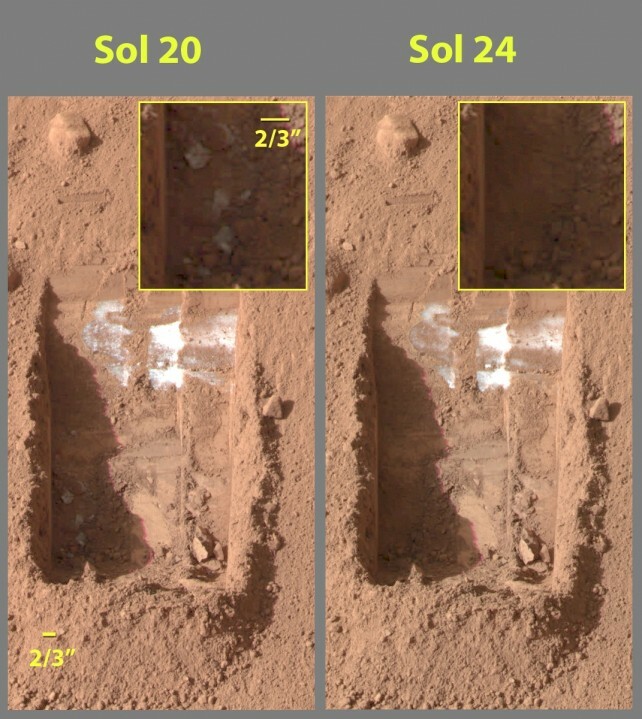 Although the robotic chemistry lab that analyzed Martian soil (see picture of soil excavation trench below) found some unexpected chemical reactions, only a very few scientists think Viking found evidence for life. 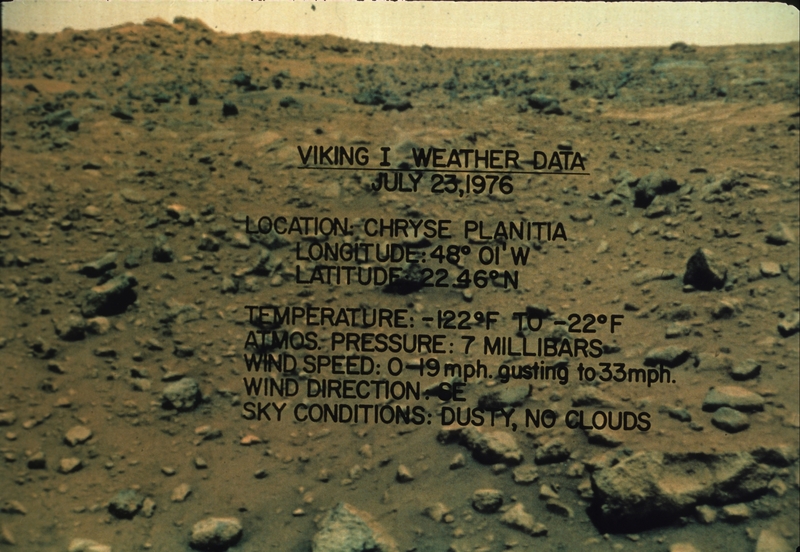 In 2008, the lander Phoenix found tentative evidence for perchlorates in the Martian soil, a result which may help explain what Viking found. After Viking failed to find definitive proof of life on Mars, interest in (and funding for) Mars missions waned for several decades. 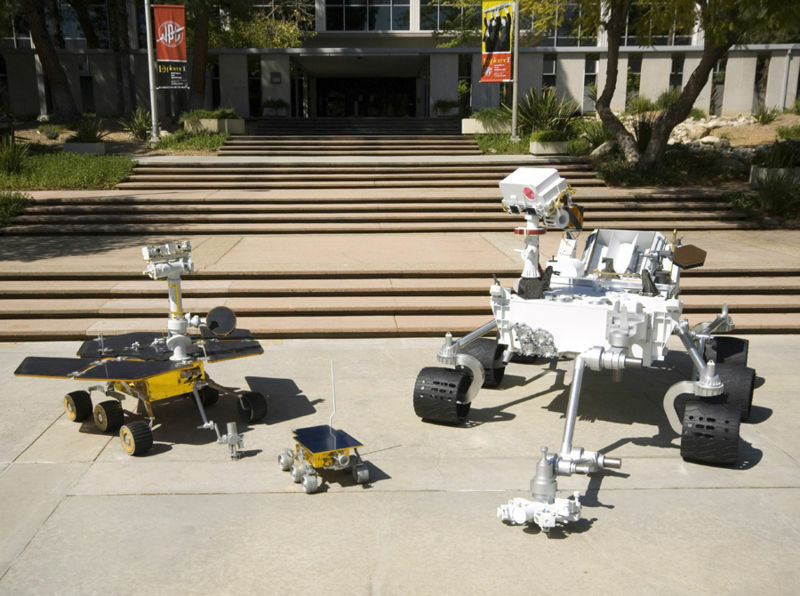 Mars rovers The largest, MSL, will (we hope) be on Mars in 2012. 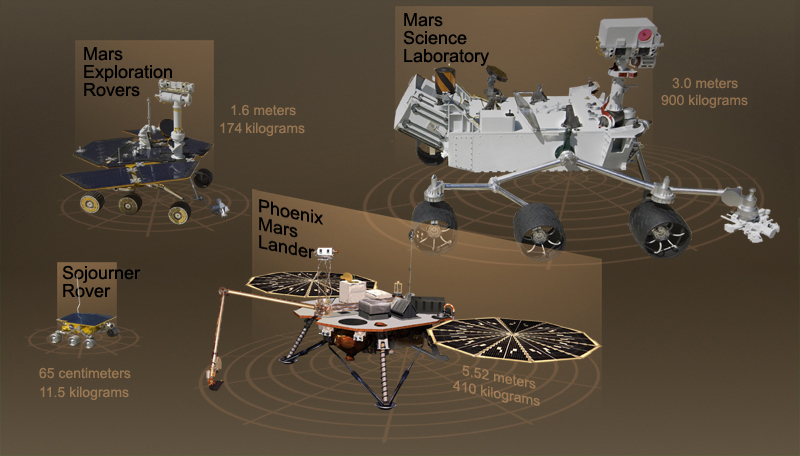 MSL (Mars Science Laboratory) Has launch window of 25 November to 18 December 2011. Would land on Mars between 6 and 20 August 2012. Keep your fingers and toes crossed! 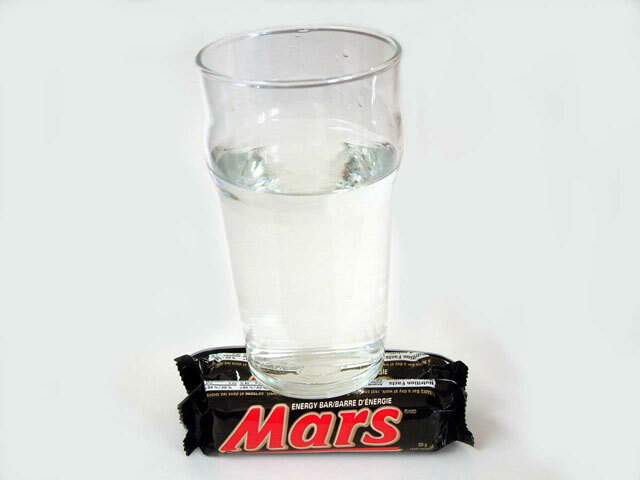 Definitive proof of liquid water on Mars What can I say- an APOD from 1 April 2005. 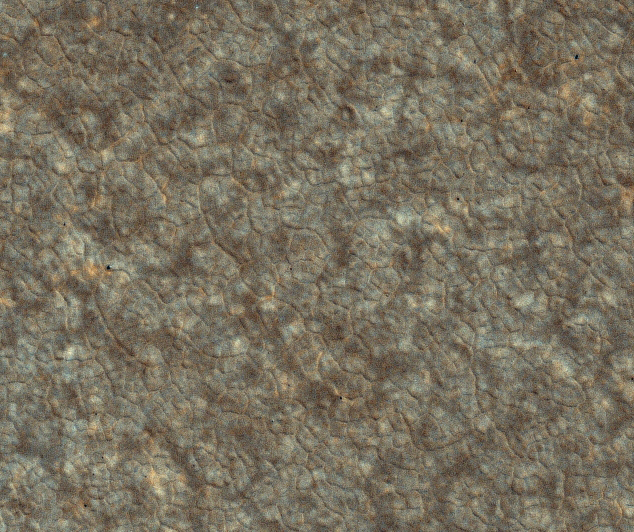 Patterned ground from Phoenix Phoenix as in lander on Mars not Phoenix, AZ. 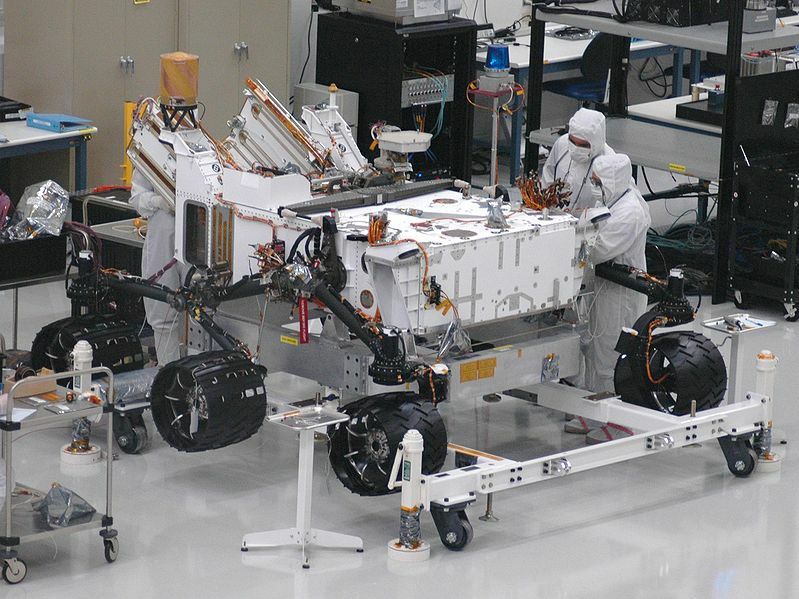 Patterned ground from MRO MRO = Mars Reconnaissance Orbiter. 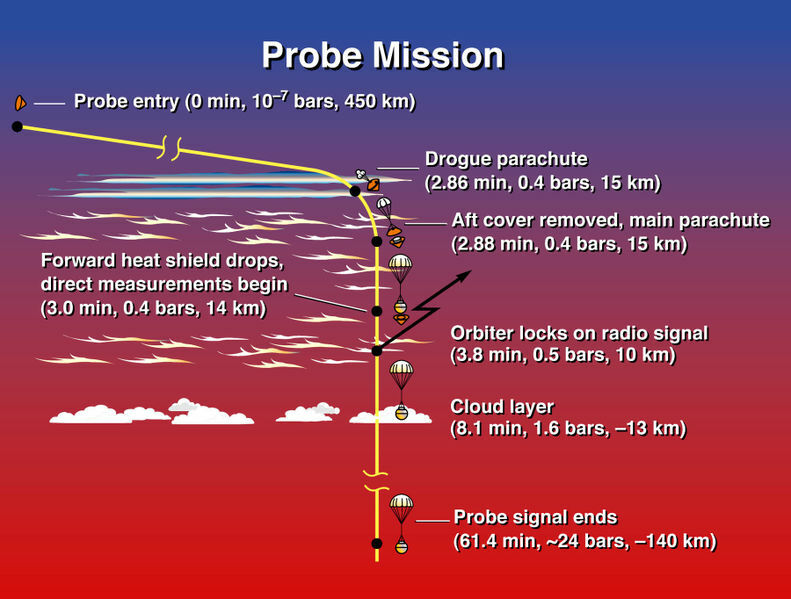 A NASA spacecraft that has orbited Mars since March 2006! 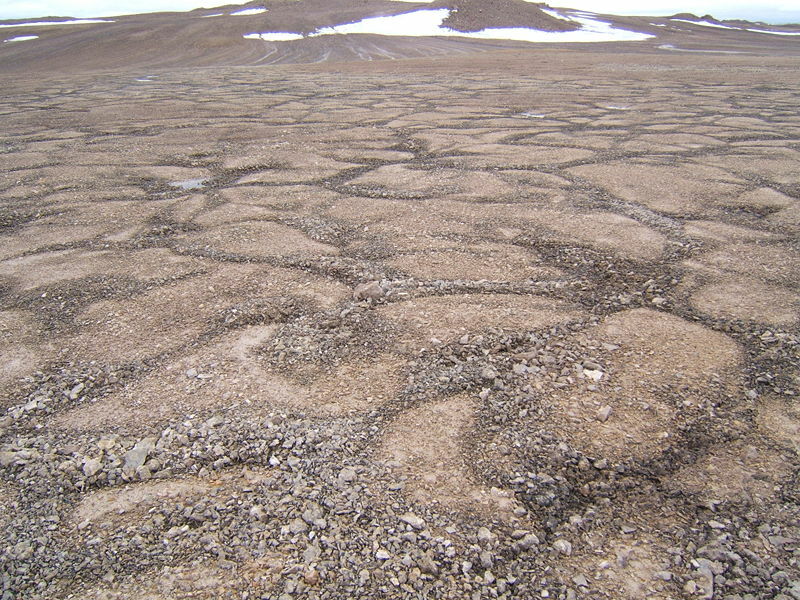 Patterned ground Devon Island Devon Island is in the north of Canada (on Earth). BTW, it is the largest uninhabited island on Earth. 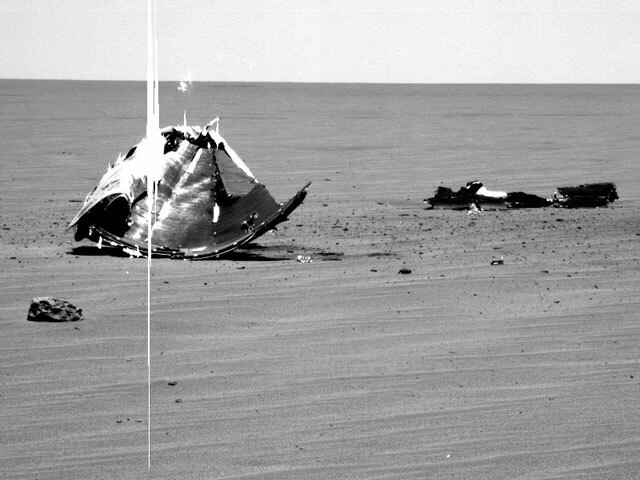 Sublimating ice on Mars Phoenix dug a trench uncovering some white stuff. In a few days, it was gone, presumably sublimated away. 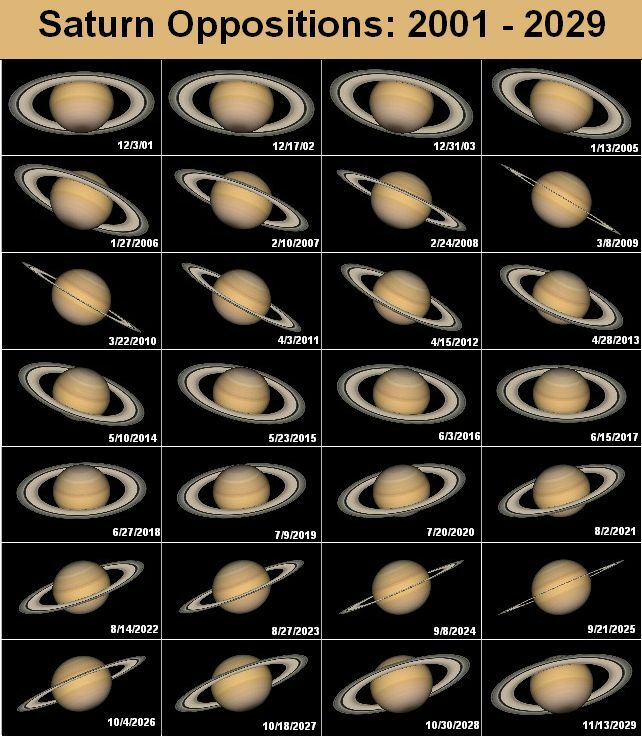 See APOD 21 June 2008 for links- also see 12 November 20008 APOD. 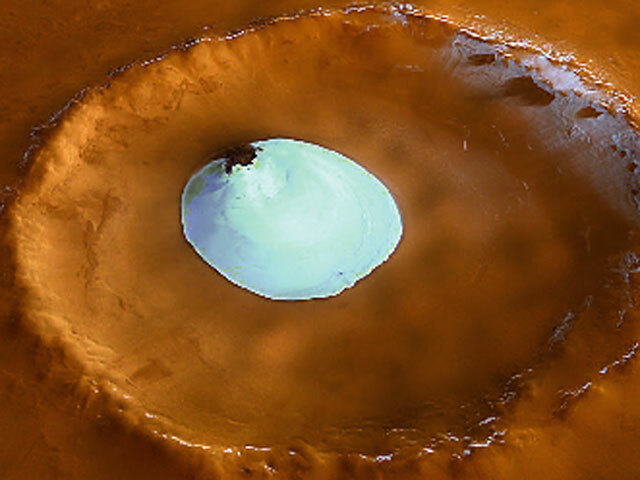 Ice in crater This is a photo from Mars Express of a crater whose bottom is shielded from direct sunlight. 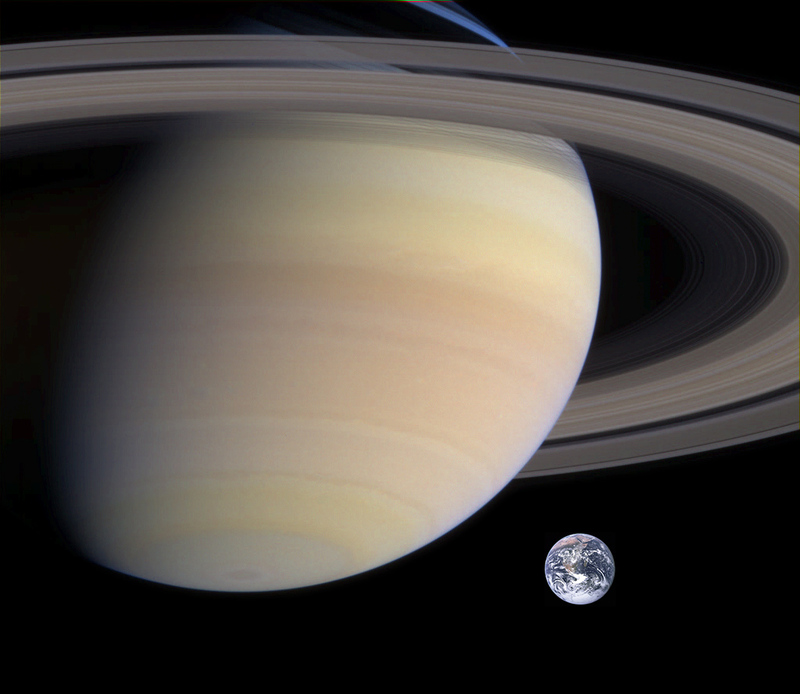 For further info, see links at APOD for 20 July 2005. Mars Express is a spacecraft which has been orbiting Mars since 2004. It was sent by the European Space Agency. It had a lander (the Beagle 2), but that didn't work. 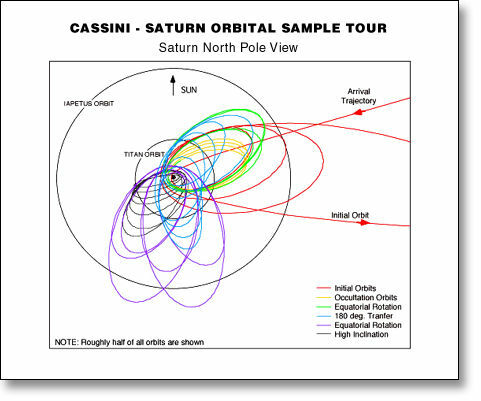 The orbiter has worked well, and is scheduled to work until at least 2012. 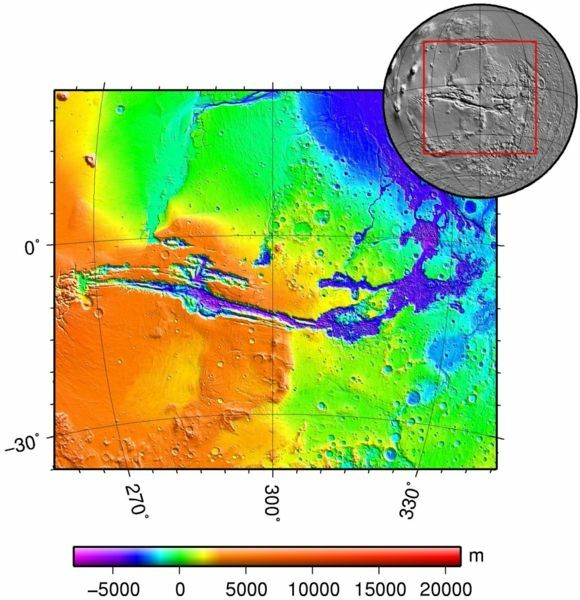 Martian flow features Ancient flow features on Mars. What was flowing and when? MRO images Opportunity Another instance of one tourist snapping a photo of another. 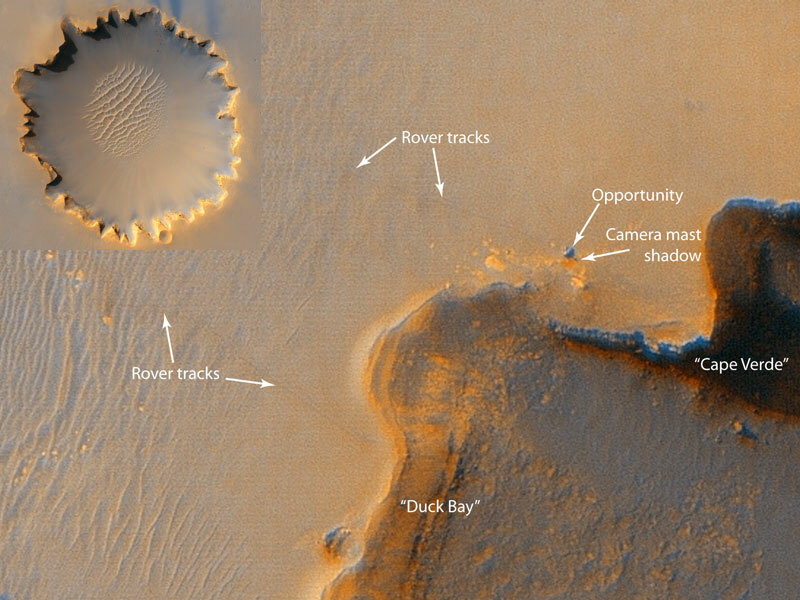 Photo of rover Opportunity from orbiting Mars Reconnaissance Orbiter. 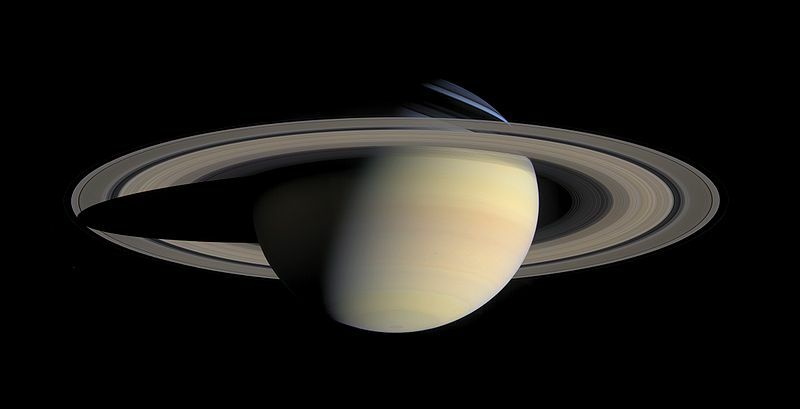 APOD 9 October 2006. Mars and Earth Left side is Morocco, right side is Mars. Martian sunset A dusty sunset on Mars. 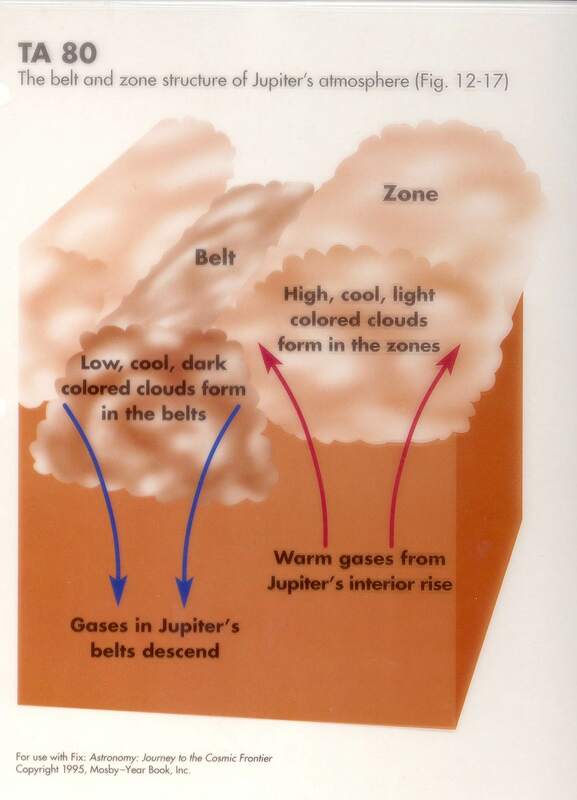 Martian atmosphere The Martian atmosphere is similar in chemical composition to that of Venus (mostly CO2), but the surface pressure of the atmosphere on Mars is 6E-5 that of Venus and 0.005 that of Earth. Why is the Martian atmosphere so thin? 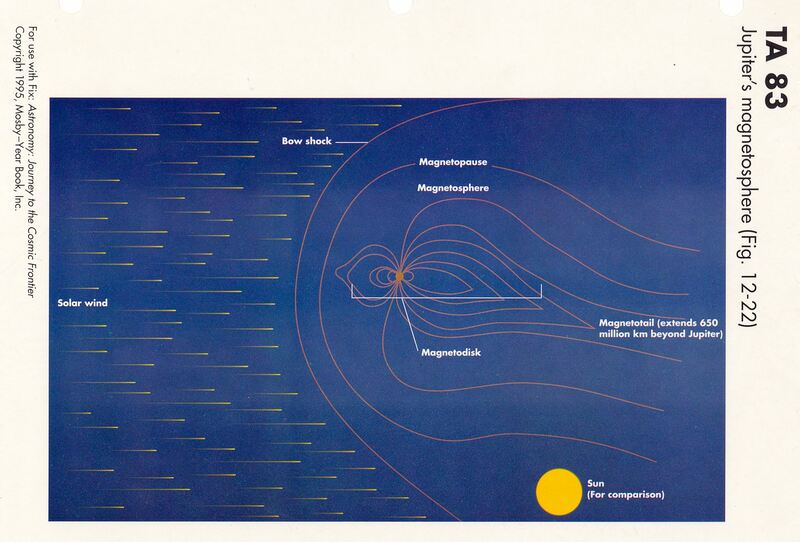 Probably a combination of several things: (1) Mars has only a weak magnetic field, and so the Sun's solar wind has been blasting the atmosphere directly for billions of years (2) The surface gravity of Mars is about 40% that of Earth, so it is much easier for atmospheric gas molecules to simply fly into space from Mars than from Earth. 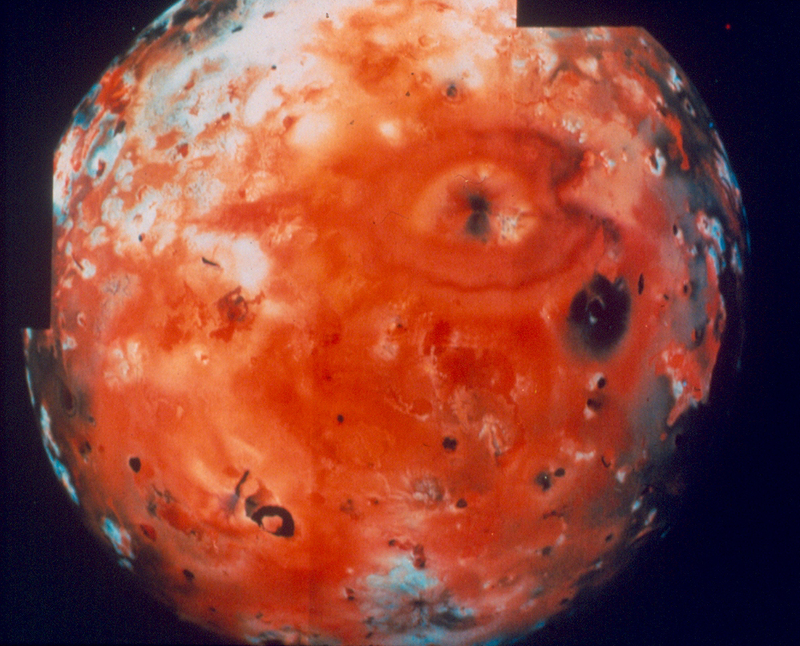 (3) Mars appears to have been pretty "dead" geologically for quite a while. No recent active volcanoes have pumped subsurface gases trapped beneath the surface into the atmosphere. Because of the thin atmosphere, there is a larger day/night temperature swing compared to that on Earth, even though Mars has a "day" (called a sol) that is only a little longer than our day (one sol = 24.6 hours). 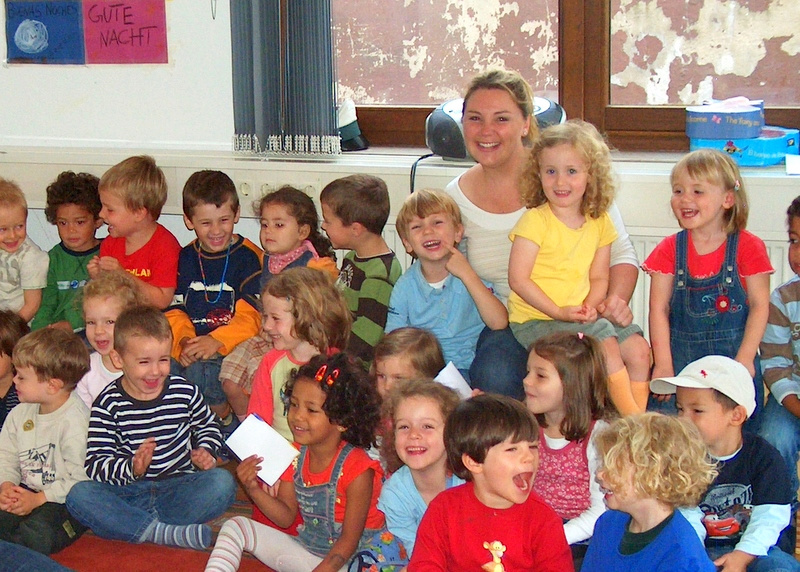 At the Martian equator in summer at noon, the temperature might rise to almost the temperature in this classroom, but at night it would drop to temperatures more characteristic of the polar regions on Earth. 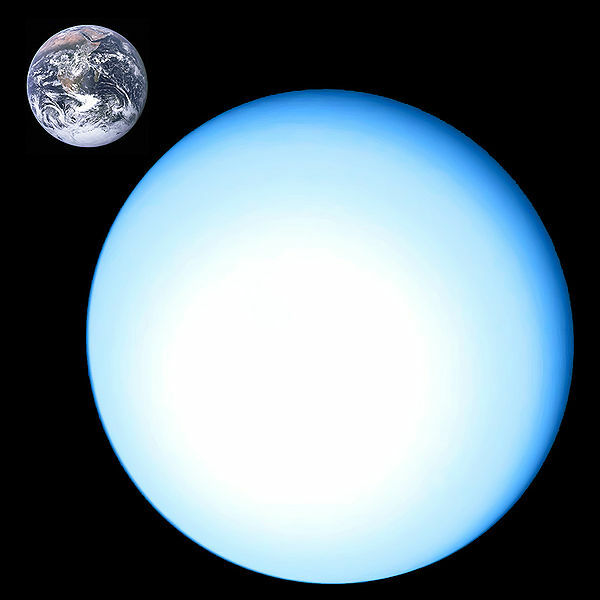 The overall average surface temperature is about 210K (about -81 F). 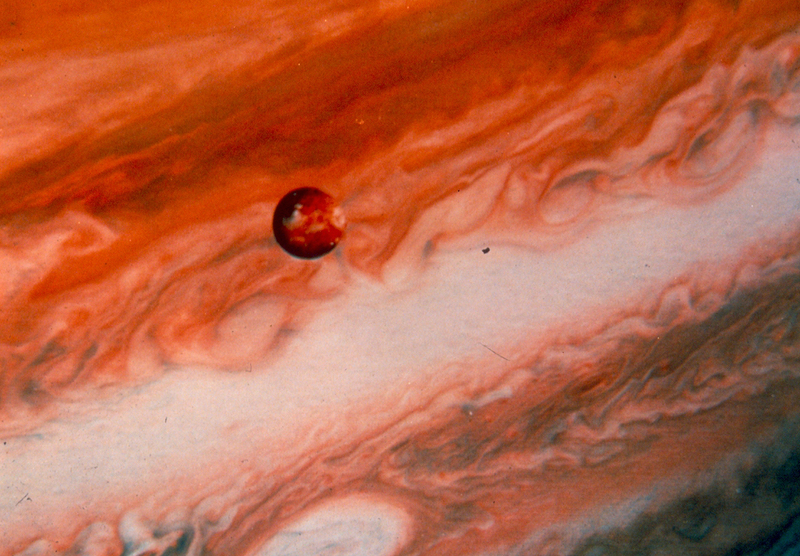 We know little of the history of the atmosphere of Mars. If the "flow features" we see were caused by liquid water, the surface temperature and pressure must have been significantly higher in the distant past than it is today. Maybe Mars once had a much thicker CO2 atmosphere that produced greenhouse warming?? Any future Martians here?? Is the first human who will walk on Mars alive today, or is she still generations in the future? Carl Sagan argued passionately for an eventually self-sustaining human colony on Mars, so that the human race would survive if the Earth is ruined, either by our own folly (e.g. all out nuclear war) or by a natural disaster of planet-wide destructive power (e.g. a 200 mile diameter asteroid strike). 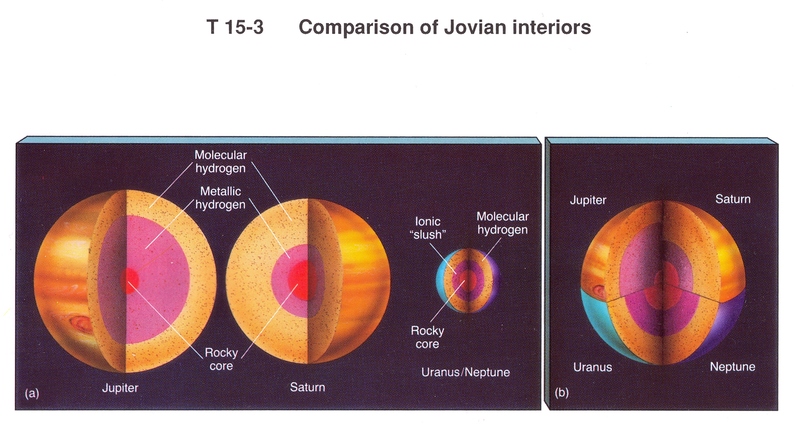 Giant Planet interiors Model of interior of 3 outer planets. 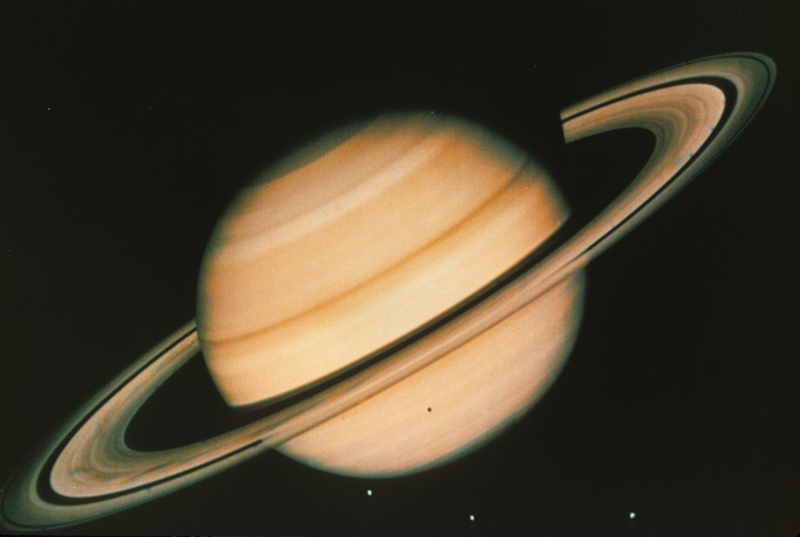 (Note that the temperature that reads 8E4 for Saturn should read 0.8E4) These are very uncertain, but suggestive of the overall structure. There are many sources of uncertainties. 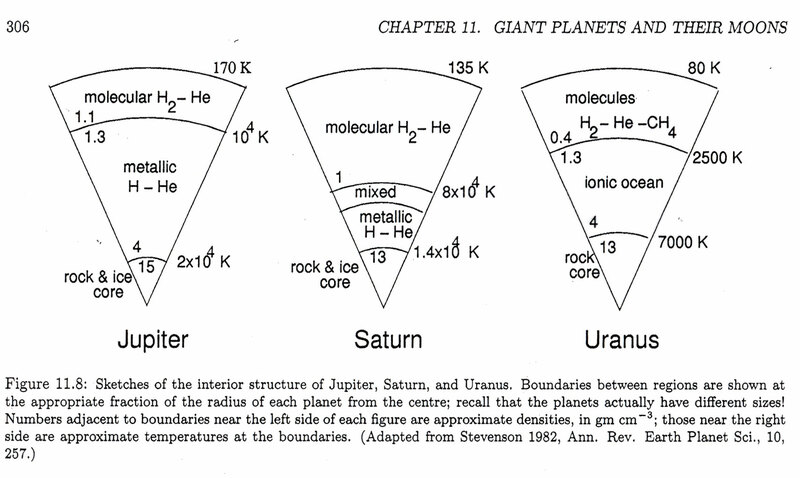 One prime uncertainty is the equation of state (EOS) of hydrogen and helium at the temperatures and pressures that hold deep inside these planets. 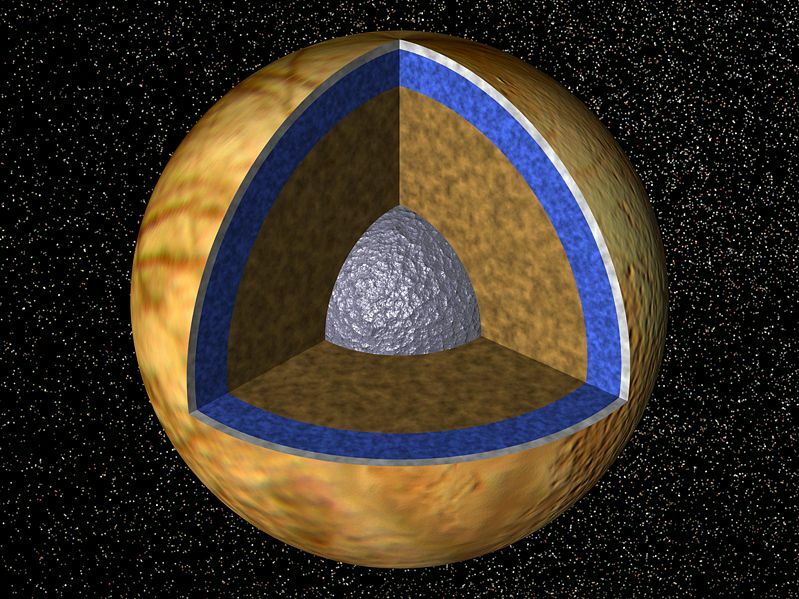 Above something like 1E6 atmospheres of pressure, hydrogen is thought to be in a "metallic" state, where the electrons are not bound to individual nuclei, but form an electron gas, similar to the behavior of electrons in an ordinary metal. We simply cannot make this stuff in a lab, except for fleeting moments of high pressure in a pressure gun. 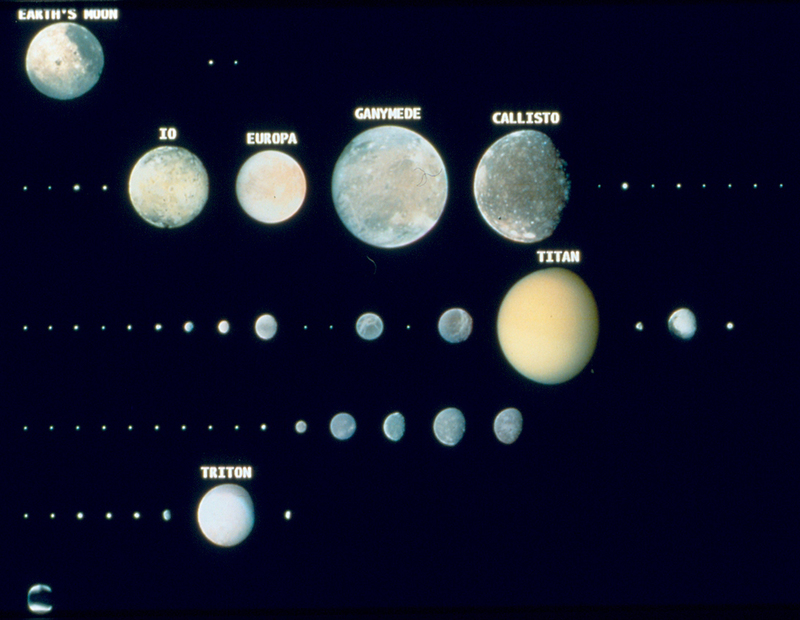 Moons of the Solar System Shown to scale are all the large and medium sized moons of the solar system, along with some of the smaller ones. Top row is our Moon, then 2 moons of Mars. 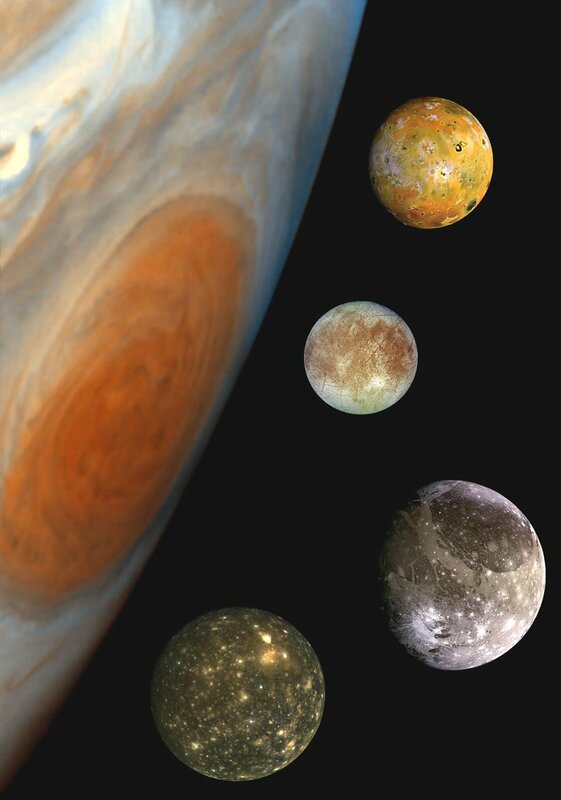 Next row is Jupiter moons. 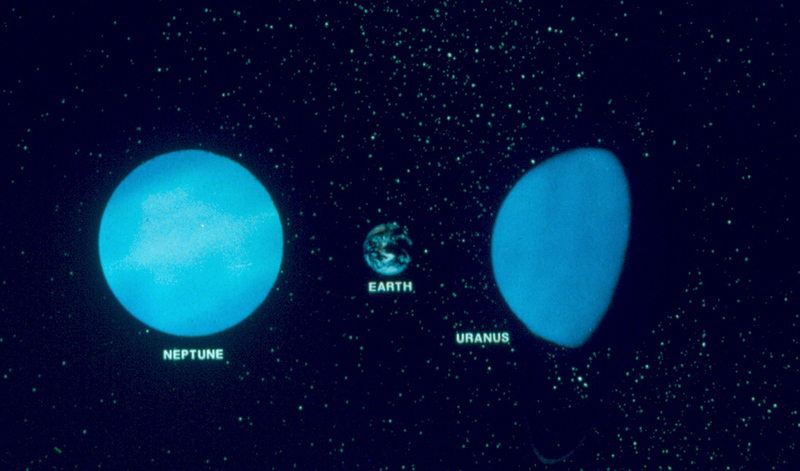 Next is Saturns, then Uranus and Neptune. Finally, Charon, moon of Pluto. 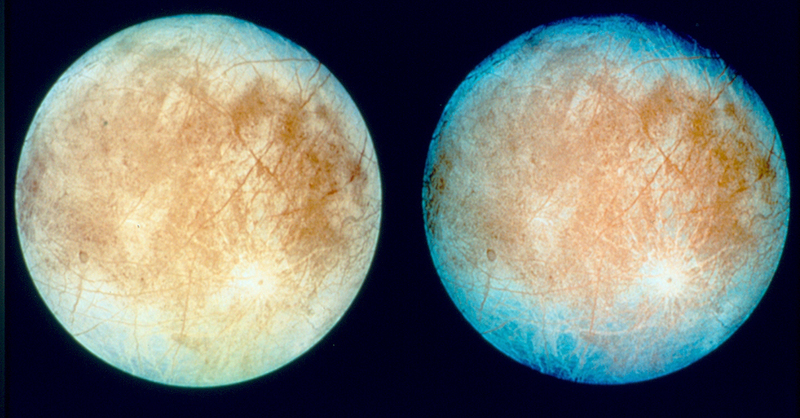 Since this slide was made, several additional moons of Pluto have been discovered. 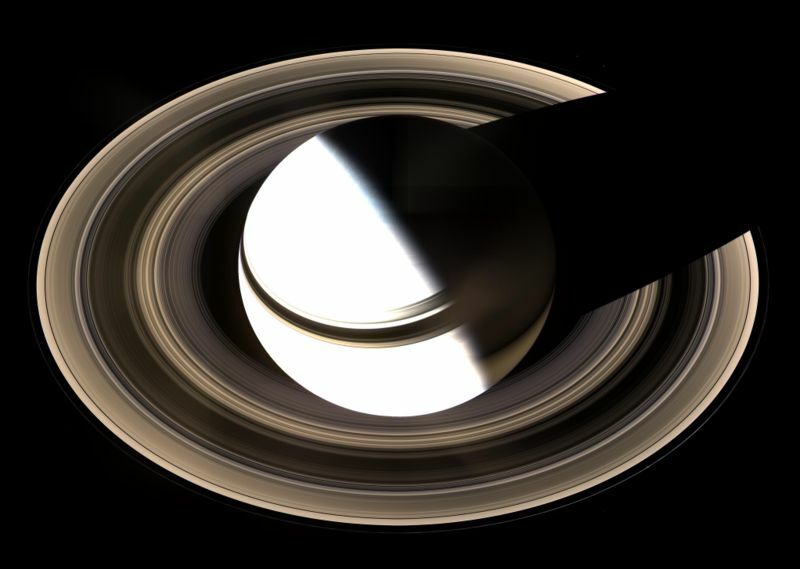 Saturn's rings at opposition As Saturn orbits the Sun every 29 years, we see the rings from a continuously changing orientation. Every 15 years or so there is a "ring plane crossing" when we see the rings exactly edgeon. The rings are so thin they literally disappear. A RPC is a good time to search for small moons in amongst the ring particles. 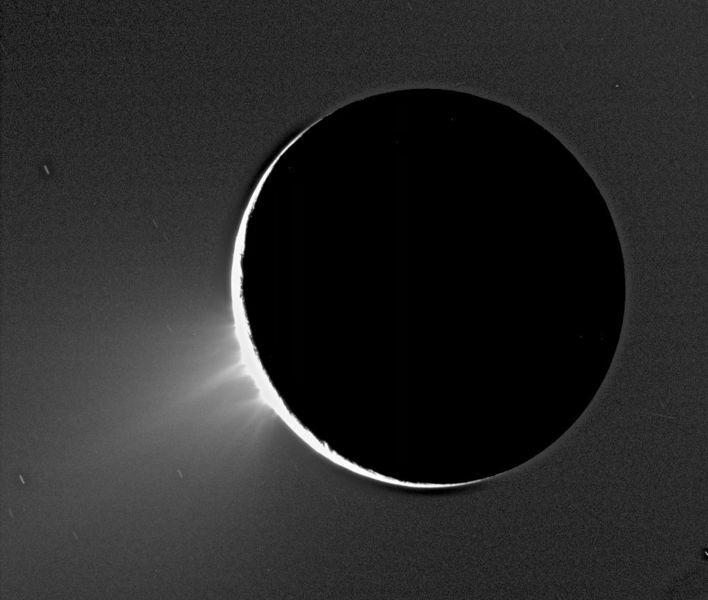 The fountains of Enceladus Enceladus is a medium sized moon of Saturn. Cassini images shows material shooting off the surface in some sort of fountain. The material is a mixture of water and complex hydrocarbons. What the heck is happening here?